We have stayed with Resortica Hawaii in the past and have always been so happy with the high level of customer service. This unit was new to them so we were not sure at first but once we entered we found everything to be perfect. Newer furniture, beautiful interior and all we needed including a grill outside on the lanai. 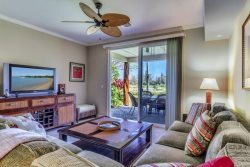 The lanai may have too much furniture as you cant move around much but it is very comfortable to sit outside. Check in/out process was easy and we had 2 parking spaces, one inside the garage the other in front of the garage. Having space for 2 cars without fighting for a space was nice. The villa was beautiful and a wonderful fit for our family of five. Our first impression was one of cleanliness and convenience. There were plenty of restaurants and stores in the community. The introductory manual had everything we needed to get started: restaurant recommendations, passwords, etc. The basic supplies offered were plenty for our week stay and included dish soap, laundry soap, shampoo, conditioner, and bar soap. We were surprised to find enough comfortable sleeping for seven as the living room had two ottomans that converted into twin beds with new memory foam mattresses as well as a large couch. The kitchen was well stocked with dishes, pots and pans, baking ware, toaster, blender, rice cooker, and some basic spices. The patio was perfect for an outdoor meal. There were plenty of towels and linens, as well as beach towels. The ice maker made enough ice to restock the cooler each day before heading out. We used the two beach chairs and boogie boards provided daily. There were some basic snorkels and masks but for real snorkeling we went to snorkel Bob's just a few miles up the highway near Foodland, where we did all our grocery shopping. It was great to be just 15 minutes from Kona on the south or Hapuna on the north. The family enjoyed boogie boarding so much that we went to Hapuna almost daily. Lone palm is close by and absolutely gorgeous at sunset. There are a couple of good snorkel spots nearby but nothing quite as amazing as the Captain Cook Monument area which was about an hour drive. We loved the villa so much that we hope to make it an annual stay. It was the perfect place to relax at the end of each day. Thank you for a wonderful stay! Mahalo! The reservation system was easy and fast. The arrival process was seamless. This unit has everything you would have at home. It is very close to the pool and gym. You can walk across the street to shopping and restaurants. The view was superb. The condo had very comfortable furnishings and the kitchen was well equipped with all the comforts of home. Parking is usually an issue at condos, but this unit not only has a garage but additional parking in front of the garage. It was perfect. Kim Horton was fantastic! She was so prompt in her responses. We really appreciated her Attention! This was one of the best vacation rentals we have stayed in! The layout, the location, the Hilton Pool Pass, everything was great! Within walking distance to the queen and kings shops. Super short drive less than 5 min) to the beach with ample free parking. A short drive to the Hilton (just over 5 min) and the free parking there with the pool pass was amazing! We have already been recommending this location to friends! What an amazing unit. The perfect place to vacation in Hawaii. It had al the amenities you could ask for. It was decorated perfectly and had plenty of room to move about. The private lanai with that golf course view and grill was great for us. The property management company was very helpful and friendly. We will not hesitate to come back and hope this property will be available for us.